Arctic Cat ATV CV Joints. 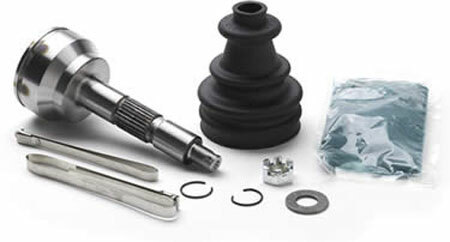 Best Prices on CV Joints, Boots, and Repair Kits. Arctic Cat ATV CV Joints. When it's time to replace your Arctic Cat ATV CV joints, you have more choices than you might have thought. This article will cover what those options are, and tips for getting the most for your money. Replacement Options for Arctic Cat CV Joints. Replace the whole axle assembly - the most expensive but also the easiest. If both the inner and outer cv joints need to be replaced - this would be the best choice. A complete axle will cost less than inner and outer joints separately.If you would like to see prices for yourself, just use the link below for the best daily deals online. Replace the cv joint - The outer joint (the one that fits in your wheel hub) is the most likely to go bad. New outer replacements aren't that expensive if you know where to get them - and of course we'll tell you that! It will take a little more effort but save a lot more money! Rebuild the joint - If you catch a split or torn cv boot before the joint has been damaged too much - it may be possible to rebuild it with a repair kit. This is labor intensive - but if you have the time and tools it can save some bucks. Replace the cv boot - If you're really lucky and find a damaged boot before the cv joint is ruined with water, mud, and dirt - you might get away with just replacing the cv boot. Same job as rebuilding the joint, just a lot cheaper! Replacing Arctic Cat CV Joints - the Video! This video will give you a good idea of what is involved with replacing or rebuilding cv joints. It's not super detailed but it shows enough so you can tell if this is a job you want to tackle yourself. Visit our friends at the CV-Restoration Store - Arctic Cat ATV CV Joints for the best deals online. Arctic Cat ATV Manual - Avoid high repair costs and fix it yourself. If you only save 1 hour of shop labor on a repair job, you've more than paid for the manual! Arctic Cat Oil Change Kit. If you're looking for an oil change kit for the ATVs - we've already sniffed out the best deals and listed them for you. Arctic Cat ATV Parts - Direct links to the best deals.